International search trends: Which sites dominate Google across national boundaries? Wikipedia.org is the most visible website in Google search results across ten countries, including the United States, the UK, Germany and France according to new research. The Searchmetrics study indicate that the second and third most visible sites are youtube.com and facebook.com, while twitter.com’s visibility has declined globally. The findings come from Searchmetrics‘ SEO World Rankings study which analyzed search results from ten national Google indexes around the globe to come up with the top ten performers in organic search in each country during 2017. 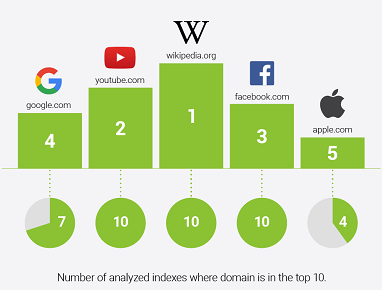 The study also identified an overall list of the five ‘Global Champions’, those five sites that are most visible across national boundaries: 1) wikipedia.org; 2) youtube.com ; 3) facebook.com; 4) google.com; and 5) apple.com. •	Since Searchmetrics’ previous analysis twitter.com has dropped out of the list of the top five most visible ‘Global Champion’ domains, having been replaced in 4th spot by google.com. •	Amazon now has domains listed in the top ten most visible sites in five different national Google indexes. The company’s Italian domain, amazon.it, has joined amazon.co.uk , amazon.com , amazon.de and amazon.fr. •	For each country the study identified those websites that had made the biggest absolute gains in search visibility during 2017. In the US, the overall winner was youtube.com, in the UK it was thesun.co.uk and in Germany, ebay-kleinanzeigen.de. •	76% of the top five sites in all the national indexes (excluding the US) are .com or .org domains. To create the list of the top ten most visible websites in each country, Searchmetrics took an average of several data points taken throughout the year. To work out the five ‘Global Champion’ sites that are most visible across national boundaries, Searchmetrics analyzed the number of countries where the domain ranks in the top ten in terms of SEO visibility, then sorted by no of 1st places, no of 2nd places, no of 3rd places etc.